She tells the story of being at home in Ukraine at the age of 8 and watching on TV as Williams - whom she calls "a legend" - fell behind in a Grand Slam match. That was, understandably, distressing to the little fan. Dayana, who'd been taking tennis lessons since she was 4 1/2, decided Williams could use some help. "She won a point. She won a game. She won a set. She won a match. I was screaming at the same time she was screaming. And when she won the match, I had in my thoughts that, `Well, I guess we won together. It's our win,'" Yastremska said, laughing at the memory. "And then I had another thought that, `Maybe, one day I'm going to play (against) her in the big arena.'" "I'm going to just go out there and obviously take her extremely serious," Williams said. "She's here, made it this far, and she's here to win." "I just say, `Hello,' and `You have a great daughter, and I respect you a lot as a person, as a player.' She told me, `Thank you so much. You're so nice, so sweet,'" Yastremska recounted. "I always wanted to be like her. 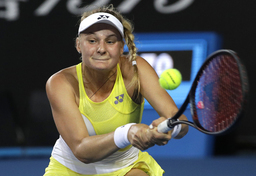 But getting older, I realized I have to (have) my own style," said Yastremska, the junior runner-up at Wimbledon in 2016 and owner of one WTA title.